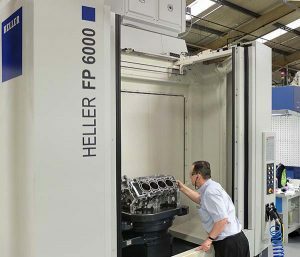 Two more twin-pallet, horizontal machining centres (HMCs) from Heller have been installed at the Booth Drive, Wellingborough factory of Mahle Powertrain, an independent company specialising in the design, development, test and manufacture of combustion engines. A four-axis Heller H2000 has joined two identical models in an eight-machine production line dedicated to manufacturing cylinder blocks, while a larger five-axis FP6000 has been added to expand the capabilities of a flexible machining cell. 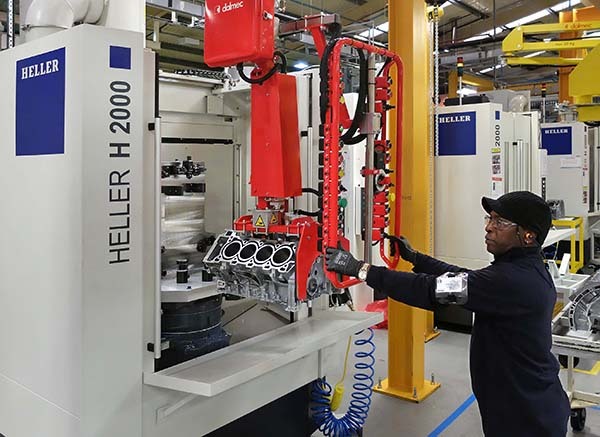 At the end of 2016, Mahle’s project manager Geoff Brown, production engineer Bob Price and others decided that the decade-old line producing aluminium engine blocks for a major British OEM needed to be upgraded. The line comprises six HMCs each performing separate operations plus two bore-honing machines positioned at the end. All HMCs were originally supplied by a Japanese manufacturer, but in early 2017 the first two machines in the line were replaced with UK-built Heller H2000s. “We were already familiar with Heller machines, as we operated 21 of them very successfully for more than a decade at our facility in nearby Ryle Drive,” explains Brown. “They were used for manufacturing cylinder heads and blocks for a British off-road machinery manufacturer, although that contract has now ended and the machines have been sold. I also had experience of working with Heller horizontal machining centres at another engine manufacturer that operated more than 20 of them in a transfer line. As a result of the successful trials, the first two machines in the production line at Booth Drive were replaced with Hellers, and the benefits were immediately noticeable. The raised productivity is largely down to the rigidity of the H2000s, the higher speed (16,000 rpm) spindles with HSK63A interface and programmable through-coolant up to 70 bar, all of which support faster cutting feed rates. Rapid traverse is quicker than before, and further time savings derive from integral hydraulics for automatically clamping the engine blocks, along with air detect for checking that the component is seated correctly. A probe in the tool magazine for identifying broken cutters further reduces time by removing that function from the cycles. Brown points out that all these features are fitted as a matter of course to the Hellers, whereas many other machine manufacturers class them as extras, increasing both cost and delivery lead-time. The offer of generously equipped, standard machines, with the enhanced back-up that their manufacture in the UK promised, was a significant factor in Mahle’s choice of the H2000s. So also was the efficient swarf management, essential to removing large amounts of aluminium chips efficiently from the machining area and avoiding hours of costly machine stoppage. No-scan/no-run safety software is run through the Siemens control to prevent a component from being machined unless its barcode has been scanned. Linked into Mahle’s new SAP ERP system, which became operational at the start of 2018, the data provides traceability to ensure stock accuracy. Capex approval to replace the third HMC was given by the Mahle board in mid-2017, and another Heller H2000 was ordered. Built in Redditch and commissioned at the beginning of this year, it took over Op 30 from its predecessor during February 2018. Again, the previous 12-minute cycle has been cut to eight minutes, despite taking some of the load from Op 50. When the fourth H2000 assumes responsibility for Op 40, it will carry out some of the Op 60 cutting scheme in addition to delivering a more efficient Op 40 routine. By then, the TAKT time for the whole line will be 10 minutes. Performing Ops 50 and 60 on Hellers in the future will lower it further to eight minutes. Another ongoing project at the Booth Drive facility is the reorganisation of the shop floor so that all six HMCs and the two bore-honing machines are in a straight line, as at present some zig-zagging is involved. This configuration will allow two operators to be deployed on other work, one from Ops 50 and 60, and one from the honing section, helping to amortise the capex more quickly. The overhead gantry is being extended and reconfigured so that the existing Dalmec equipment can be retained for handling the 45 kg aluminium blocks in and out of the machines. A further notable advantage of the rearrangement will be to slash work-in-progress to two or three components, whereas at present there are sometimes as many as 100 queuing on the shop floor. The beneficial consequences will include major savings in tied-up capital, reduced double handling, minimal risk of damage and less space occupied on the shop floor. The line currently operates 24 hours a day, five days a week, saving overtime compared with when it ran 24/7 due to a previously longer TAKT time. Tight tolerances are held, including 50 to 70 µm on true position of some features and 10 to 12 µm on holes up to 16 mm diameter. 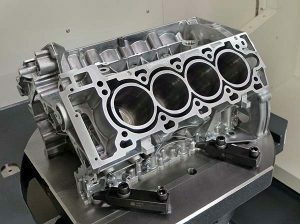 Prior to honing, each cylinder bore and crank bore is pre-machined to 28 µm roundness, 0.15 mm true position and 50 µm squareness. In another development elsewhere in the factory, at the start of this year a Heller FP6000 five-axis HMC built in Germany was added to a pre-existing flexible machining line that already comprised a vertical machining centre and three HMCs of a different make; all five-axis models. During a recent open day at the Wellingborough factory, it was explained that the line has been relaunched as a facility for the manufacture of heads and blocks, as well as a wide range of other prismatic parts, from one-offs to runs of up to 20,000, for customers in any industry. 600 UK used MACH as the platform to announce its rebranding to Colchester Machine Tool Solutions. 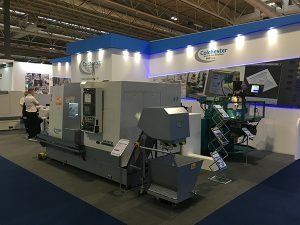 Colchester is a strong brand that is recognised globally, which the company says provides more opportunity to grow the business, along with its reputation for providing machine tool solutions and services. Colchester Machine Tool Solutions will continue to promote its existing branded product portfolio of: Colchester/Harrison manual, CNC combination and slant-bed CNC turning centres; Clausing workshop machine tools and MillPWR CNC mills; Pratt Burnerd work-holding solutions; and Gamet Bearings machine tool bearings. Over the coming period, the company will be updating all of its branding on products, services, stationery and online platforms. Continued development at XYZ Machine Tools sees the arrival of its seven machine HD (Heavy-Duty) range of vertical machining centres. These machines supersede the previous series of box-slideway models in the XYZ range and complement the latest LR (Linear-Rail) machines that have been added to its catalogue. XYZ says that HD machines will allow maximum metal removal rates thanks to their Meehanite cast beds and columns, along with induction-hardened, ground and Turcite-coated box slideways. X-axis travels extend from 660 to 3000 mm. 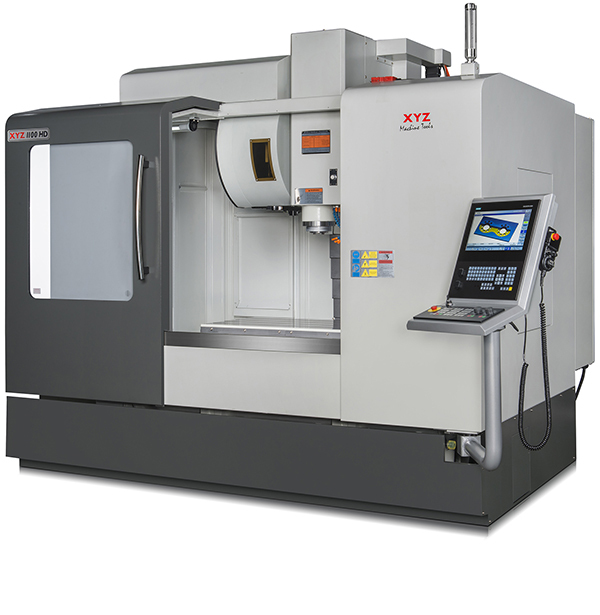 The range starts with the XYZ 660 HD, which features increased X- and Y-axis travels of 660 and 450 mm, yet retains a compact footprint. The other machines in the series are the XYZ 800 HD, 1100 HD and 1510 HD, with three ‘super-heavyweight’ machines, the XYZ 2010, 2510 and 3010 HD, completing the range. XYZ reveals that the four smaller HD machines all feature increased axis travels, as well as increased spindle power where it was deemed necessary. 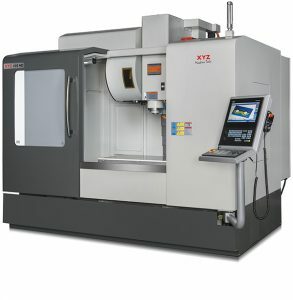 For example, the XYZ 660 now has a 25 kW spindle, an increase of 123% over its predecessor. Spindle speed is also improved by 25% to 10,000 rpm, with other machines in the range gaining around 66% spindle power. The Siemens 828D ShopMill control featuring 15” touch screen is fitted as standard, with the control pendant-mounted on several machines in the range for further ease of use. Customers also have a number of options available, such as 4th- and 5th-axis attachments, swarf conveyors and on-machine tool and workpiece probing. The Bowmill Group, which provides precision engineering, grinding and surface processing services to the aerospace sector, has installed a Chiron FZ12 FX Magnum Vario five-axis vertical machining centre to help it supply critical landing gear components to Safran Landing Systems for the Airbus A320/A321. 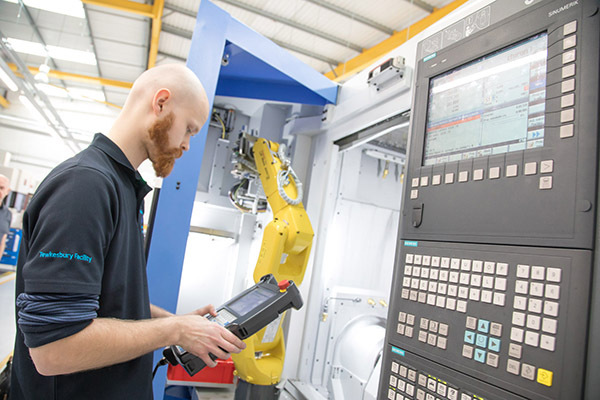 Supplied by the Engineering Technology Group (ETG), the turnkey package comes with 64 HSK tool stations, the latest measuring cycle probe system from Renishaw and a Fanuc six-axis robot with automated pallet system to support lights-out manufacturing. The machine has now been installed and is producing 1500 units per month, with a 9% improvement in accuracy across all of the 10 prismatic parts that have so far been proven out. Nick Epps, managing director of Bowmill, says: “More than £2.5m has been spent with ETG on supplying a range of Quaser, Nakamura and Chiron technologies, and this has not only given us significant additional capacity for existing and future work, but allowed us to meet the aerospace sector’s demand for quality, delivery, support and commercial objectives. Available through UK distributor 2D CNC Machinery is the new German-built Alzmetall GS 1400/5-FTD five-axis bridge-type machining centre. 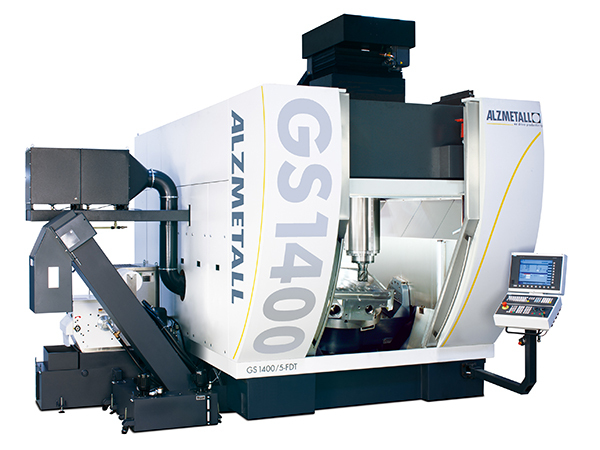 The Alzmetall GS 1400/5-FTD is able to provide a complete in-cycle production sequence involving 3D turning, boring, milling, contour milling and five-sided machining on complex components, including those with customised gear forms. High orders of precision, contouring form and geometry are aided by the machine’s patent-pending ‘4-Guideway System’, where the bridge is carried inside the structure of the GS 1400/5-FTD. The more traditional method is to mount the bridge on top of the side supports with just two guideways. Thanks to the 4-Guideway System, the machine is able to maximise the benefits of the latest control software technology. By way of example, when producing customised gear tooth forms, such as those found on compact double helical, herringbone and bevel gears, the machine has the ability to automatically compensate for factors such as residual deviation found within the workpiece material. This compensation is achieved by utilising Heidenhain’s TNC640 control and its Load Adaptive Control (LAC) package. LAC is able to optimise control parameters and enable any possible deviations or minor errors in the cycle to be maintained within 10 µm. Weighing in at 31,000 kg, the GS 1400/5-FDT machining centre has strokes of 1200 mm in X, 1300 mm in Y and 800 mm in Z, with a rapid traverse of rate of 82 m/min in each axis. Positional accuracy is within 5 µm. The A axis offers ±140°, while both swivel and rotary axes are powered by direct-torque drive motors delivering 30 m/min pivoting speeds. An 82 kW, 14,000 rpm, 500 Nm spindle is supported by tool magazine options between 33 and 250 pockets.